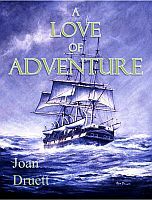 A Love of Adventure by Joan Druett – Born at sea and raised on shipboard, adventurous young Abigail Sherman wants nothing more than to be wedded to the ocean for life. Like her mother, a pioneer seafaring woman, Abigail is convinced that her destiny is to be a captain’s wife at sea. Instead, fate conspires against her. A Love of Adventure steers the reader through Abigail’s incident-ridden voyage to a nail-biting conclusion, with many exotic landfalls on the way.